1. Make your arepas. See directions here. Keep in oven until ready to serve. 2. Crumble tofu over a bowl in the sink, squeezing out as much water as possible. The bowl is to help catch any pieces of tofu that slip away. Catch them all and place in a medium bowl and set aside until needed. 3. In a large non-stick skillet over medium-high heat, add the oil and turmeric. Stir to combine. 4. Add the black salt, granulated onion, granulated garlic, dill, curry powder tamari/soy sauce, nutritional yeast and freshly ground pepper, to taste. Stir well and allow to toast slightly. Add the tofu, tomatoes and chopped Brussels sprouts and stir well. 4. Continue to cook, stirring often, until the tofu is browned, slightly crusty and warmed through, around 5-10 minutes. Serve immediately with warm arepas. I think the slow morning routine is great! Brunch it up! I’m defintiely missing our routine now that marathon training season is over…guess I need to get that boy of mine training for something else! Sounds like a fabulous meal to compensate for all those calories burned! 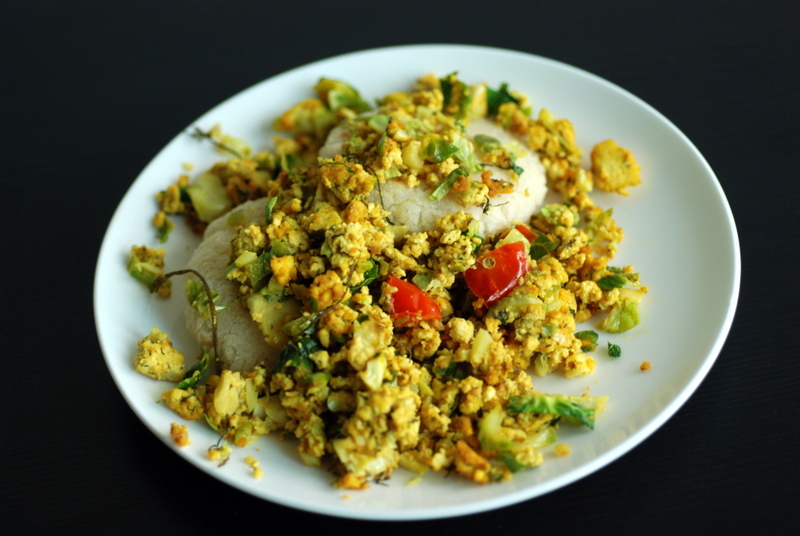 Loving the idea of curried tofu scramble. That sounds like a perfect weekend routine. Saturday mornings with me are dedicated to pancakes and a good walk to the Farmers’ market. I still haven’t made arepas but really really want to! Haha, arepas are totally a type of savoury pancake! Rob likes to make them on the weekend so we can both enjoy them fresh.. they aren’t as good as leftovers. ❤ arepas! Had loads of them in Colombia 🙂 Now I miss them and would love to re-make them! I looooove slow morning routines. I usually get up way earlier than any normal person would consider just so I can laze around, eat breakfast slowly and read some blogs/the news. It’s my favourite time of day! I love that you added dill and curry to this! I bet it tastes awesome! Warming from the curry but a good balance of cool from the dill. Awesome! 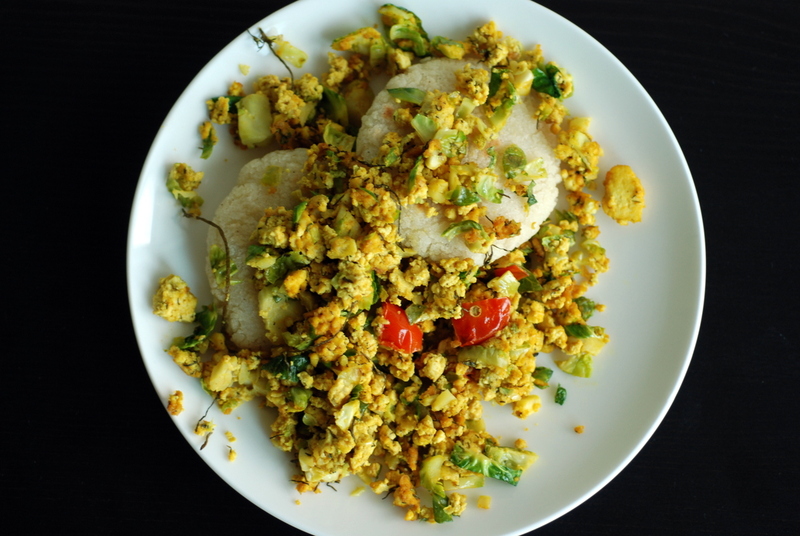 Mmmm I love adding dill to things – what a great idea adding it to a scramble. Oh my! 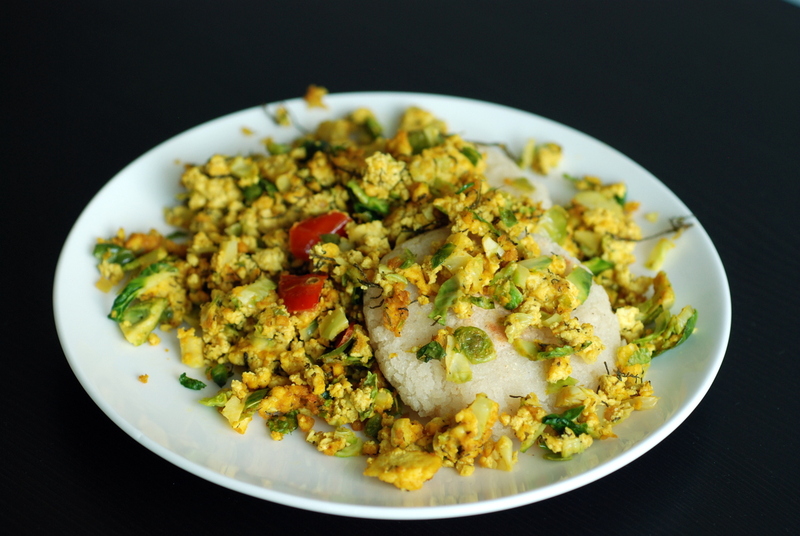 This is going to be my next tofu scramble, for sure! I’d never thought of combining dill and curry, but I have no difficulty taking your word for it – it can only be awesome!